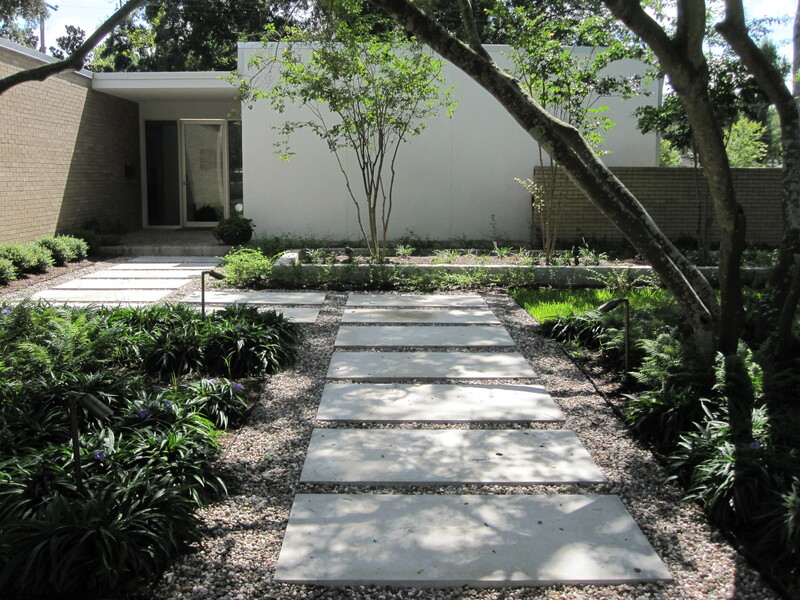 This mid-century home was being remodeled and the client wanted a garden which reflected the home’s roots and complement the updated modern look. The owners actually bought the vacant lot next to this home as a building site and then a friend suggested they buy the house next door which was for sale too. They decided to remodel the house, take down the fence and make a big yard for their family. 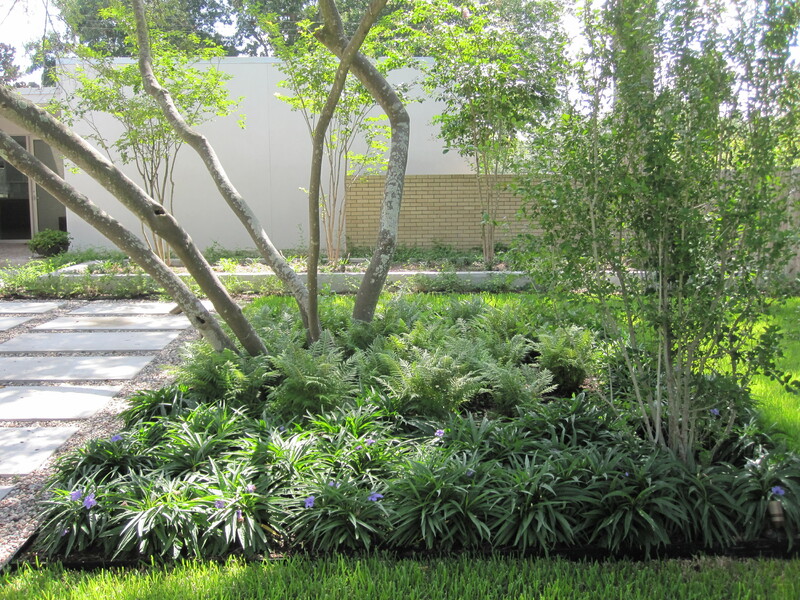 We used clean lines, many native plants with a color palate in shades of green. 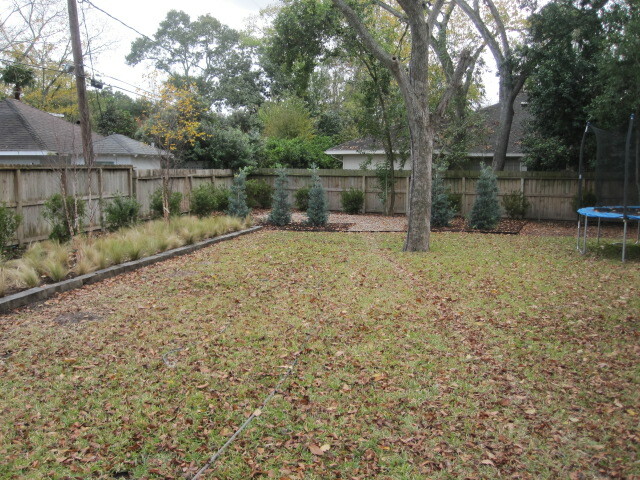 The front garden had beautiful native yaupons that we kept, adding a rectangular bed around them. 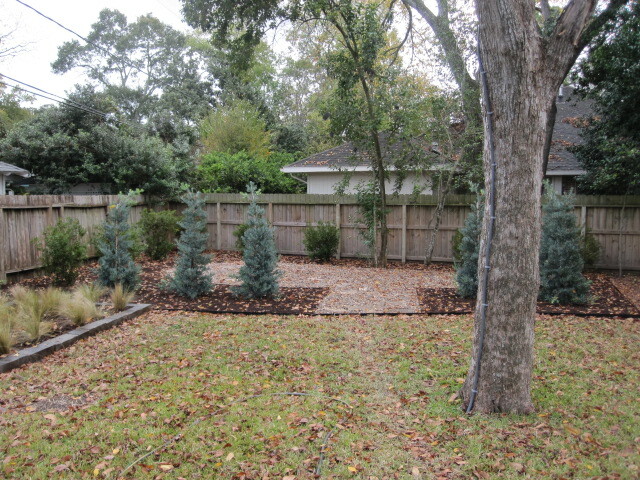 In the back there is a double screen of wax myrtles and river birch to add privacy from the property behind. This is future planning because it is likely a new home will be built there in the future. 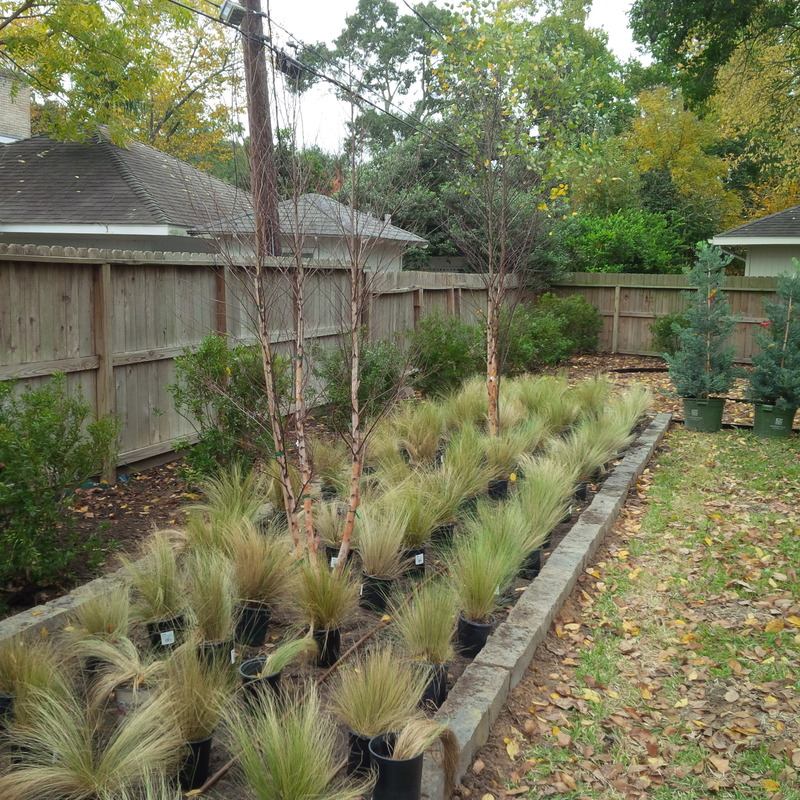 We left part of the back garden wild adding a few maples, possumhaw hollies and pride of Houston yaupon hollies and several kinds of ornamental grasses. 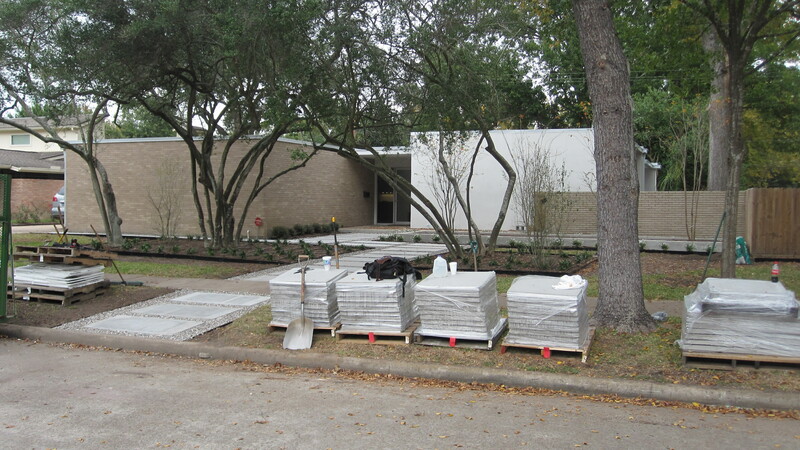 In the front we started with a blank slate except the Pride of Houston Yaupon hollies. 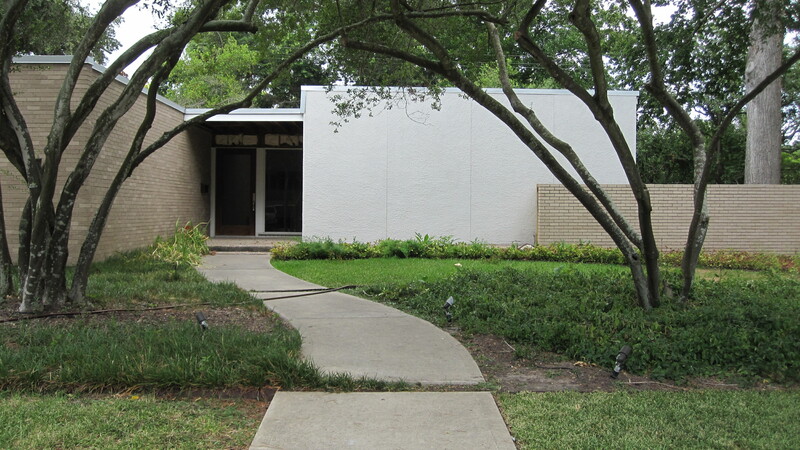 Before: The curved concrete path and old plantings seemed dated. 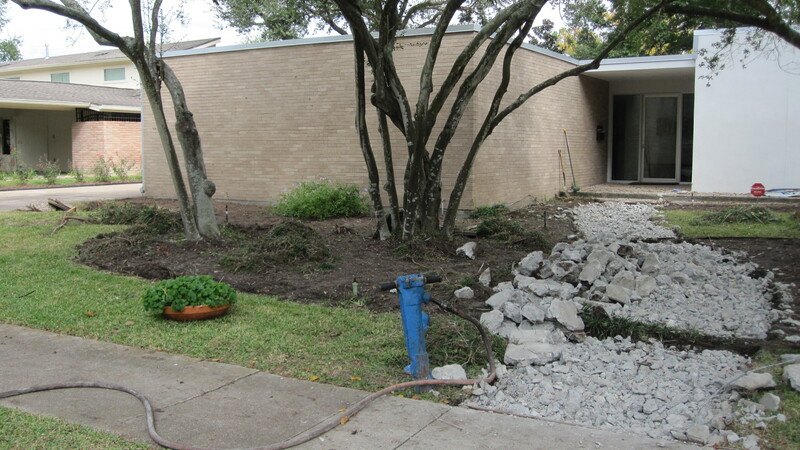 First we needed to remove any unwanted plants and structures. The old holly trees were in good enough shape to leave. Their arching branches created a fun tunnel to the front door and we were glad to be able to keep them. Before just finished cleaning up the beds so we can shape them. Besides the undesired plants there was the undesired concrete. Its removal took two days and several trips to a concrete reclamation center. After the larger pieces of concrete were removed we got as much of the small pieces out that we could. If you focus on the photo below you can just make out the orange string we used to lay out our pattern/edges for the pathway. The strings help both define the edges as well as guide the height of the stones. Once the steel edging is installed the string-lines are no longer needed. We edged the pathway as well as the beds which flank the entrance. 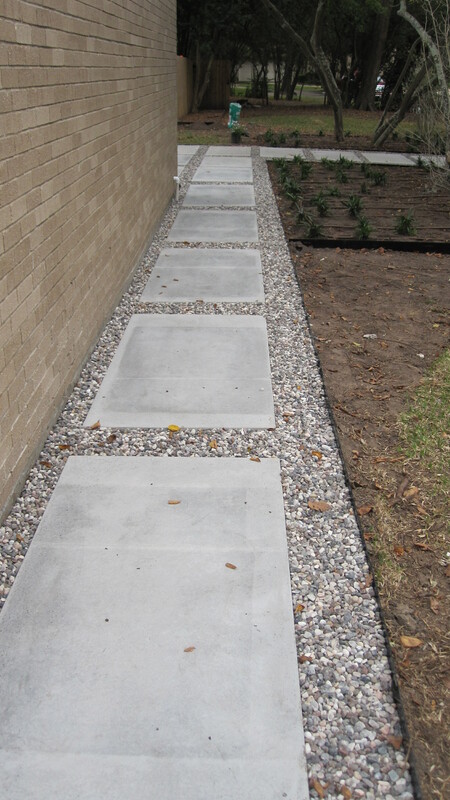 The soil between the path is broken up in order to create a consistent density for the following layers of gravel and cement stones. 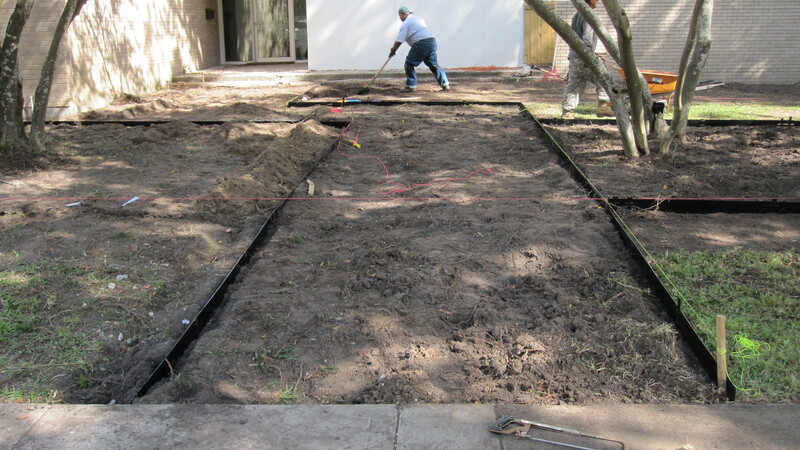 Steel edging borders to path. The stones, once placed, look like they have been there since the house was built. While this image does not portray their size each of those pads are 5 feet by 2 1/2 feet, 3 inches thick and several hundred pounds. Laying them in place is greatly aided by having the ground beneath graded and knowing exactly how much spacing goes between each stone before it is even picked up. About a month ago we returned to look at the garden and found the plants filling in nicely. Wood fern mingle with the Katy ruellia giving similar textures but maintaining different heights. We also added to Possumhaw hollies for winter interest. 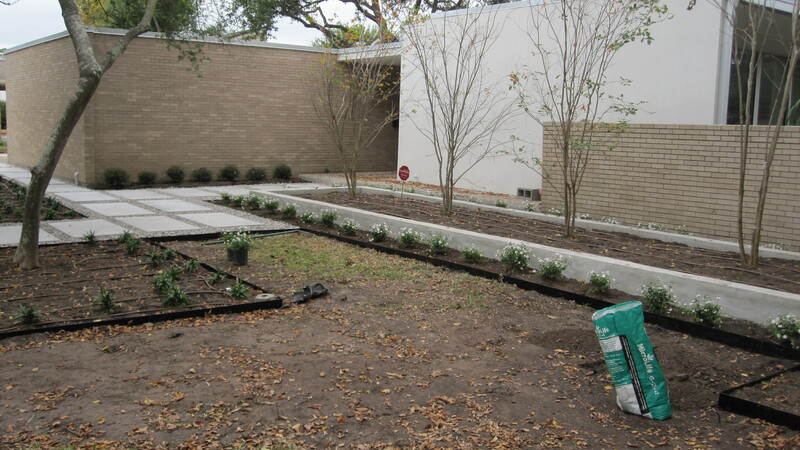 The raised bed, seen above, is also created of concrete blocks (cinder blocks). Once more, good preparation work makes the installation much smoother. We had to strip the soil and level the area before we could begin setting the first stone. 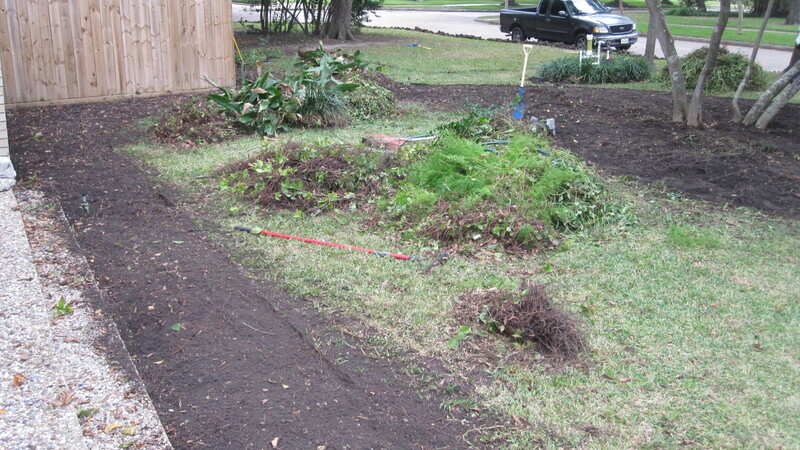 Before – clearing area for raised bed. 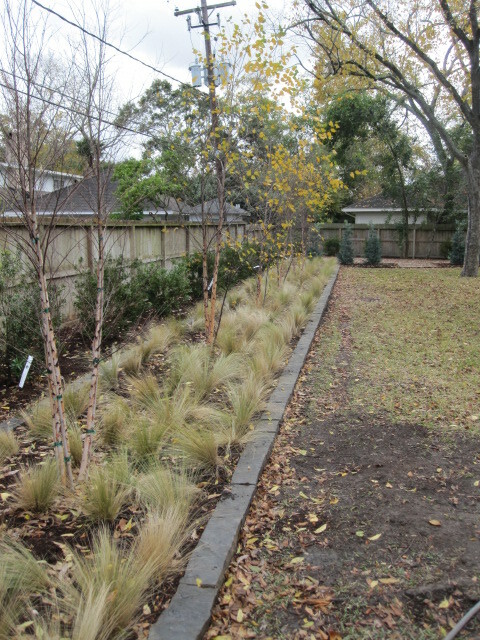 The raised bed recently finished with the crape myrtles just installed. All of our beds are edged before we plant them. See how thin the ruellia are around the holly tree. They thrive in our climate as do the white trailing lantana that surrounds the raised bed. Raised bed with crape myrtles. Along the far wall is a row of dwarf yaupon hollies, a pattern that is repeated in the back garden. Cement pads second delivery for back garden. 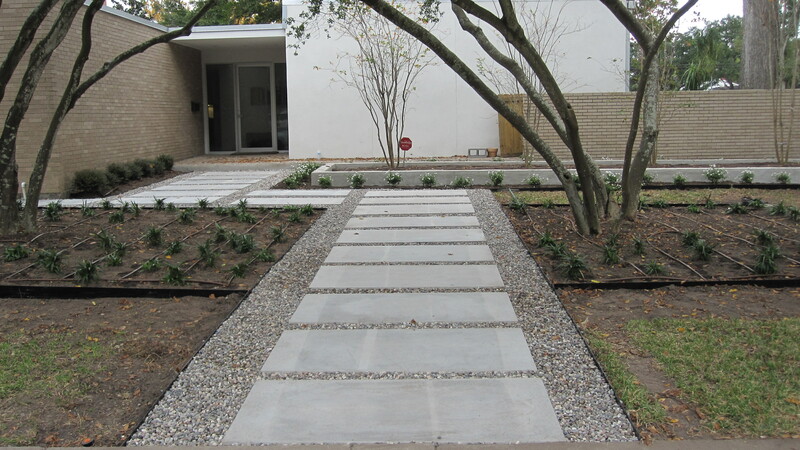 The pads are surrounded by gravel both for aesthetic reasons as well as functional. 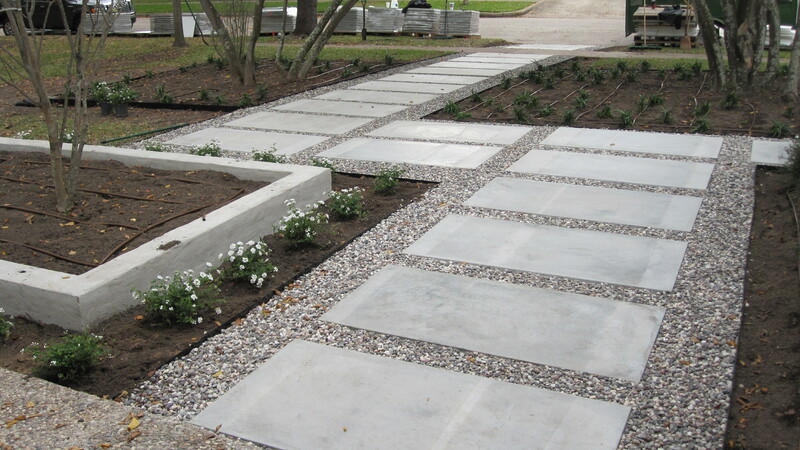 The gravel helps lock the pads into place and the color helps tie the grey in with the surrounding plants. We like what is called rainbow gravel in our market. The stones are rounded and easier on your bare feet. A narrow path leads across the front of the house to the driveway and garage. In any product there can be variation in the dimensions (width, length and even sometimes thicknesses) which can create challenges for installations; especially when the straightness is important for the continuity of the design. Using a string-line helps guide you to making good decisions about which way to shift stones (it also keeps your eye from tricking you!). 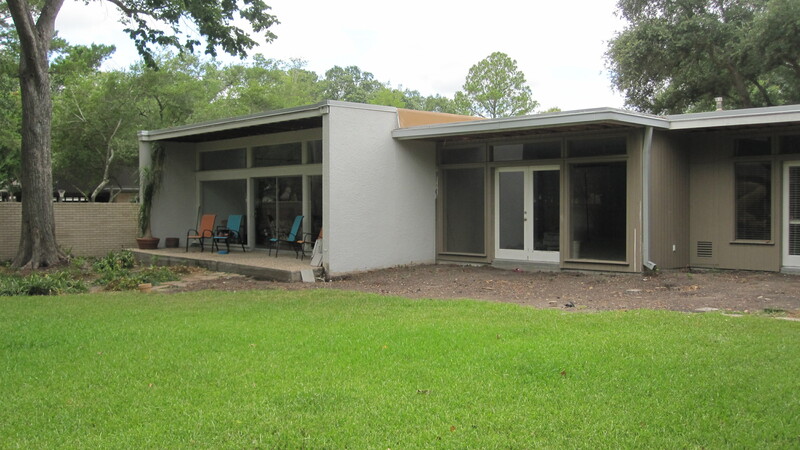 The side of the house, in the backyard, held the same characteristic low slung modular style as the front. The living room faced a large oak tree while the adjoining family room was a bit orphaned. A small patio was to be added and we wanted to make the area more inviting from the inside as well as usable when outside. Before – the areas off living room and family room. 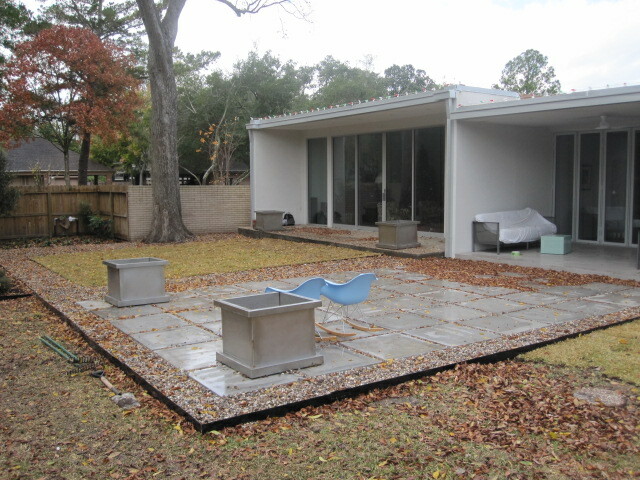 Taking the cues from the front we used cement pavers (this time 30″ x 30″) to create a large patio off the family room. We raised the area three inches with gravel which created a deeper profile for rainwater to accumulate/filter through before running off the property. Only a few more pavers to go. 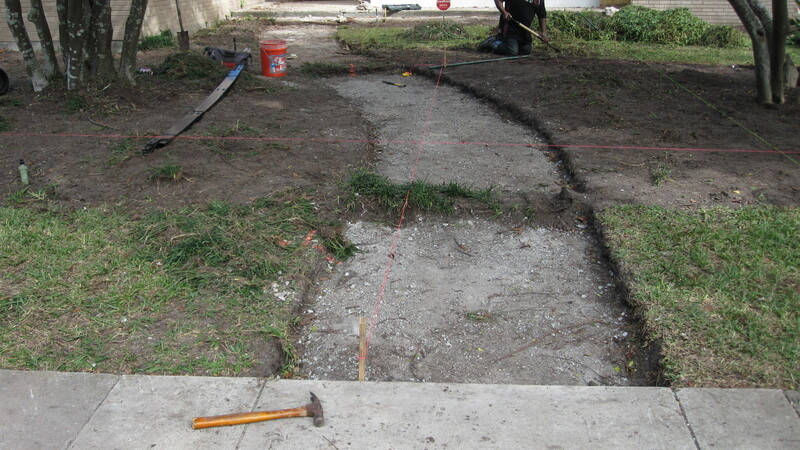 We kept the string-line so that we could check the straightness of the outer block as each row was laid into place. 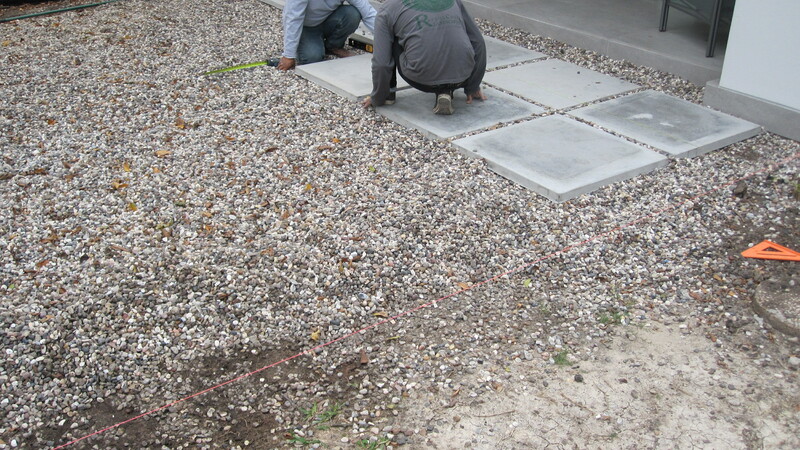 Once the last pavers were set we edged the space with steel edging and infilled with gravel. 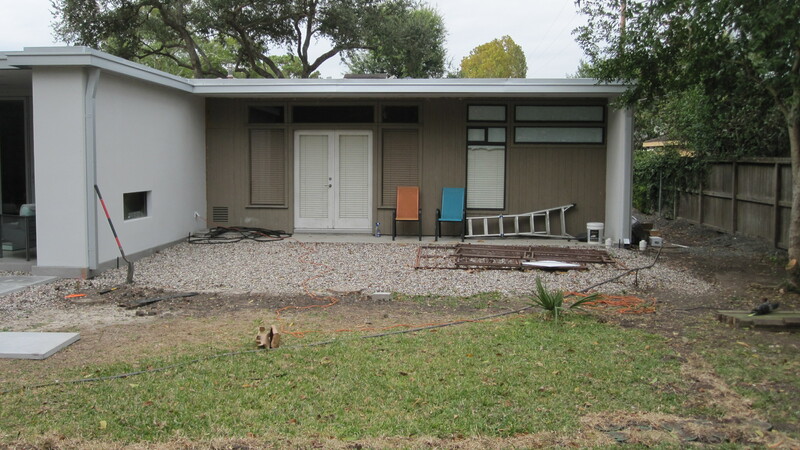 While it is difficult to make out in this image a quadrant of lawn is just outside of the living room, edged with steel and gravel. 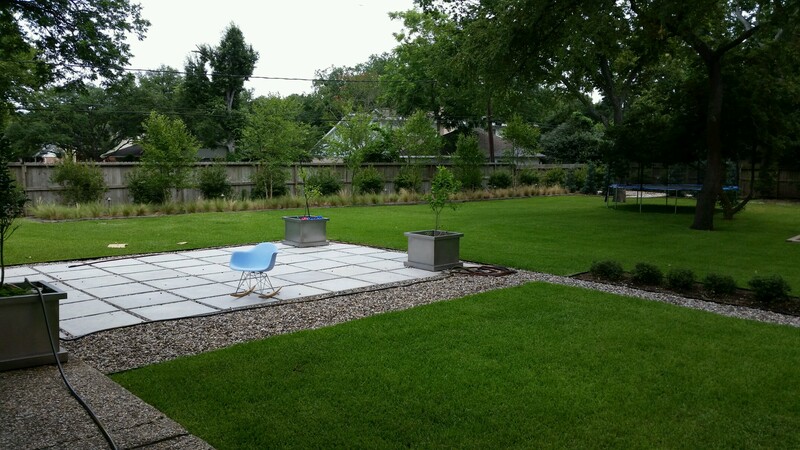 Before we left the property we installed soil along the outer edges of this patio to create a gentle transition between the patio and the lawn. The master bedroom was a mess of soil and everything that happens when remodeling occurs. The client, knowing what materials were going to be used, had rainbow gravel piled off of the bedroom to fill in the mud-holes. 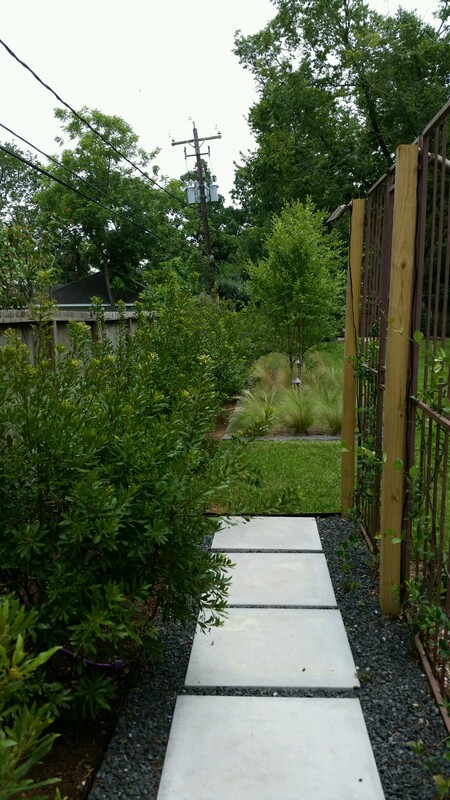 We re-used old gates from the property (burglar bars) and created a simple trellis upon which we are growing star jasmine. 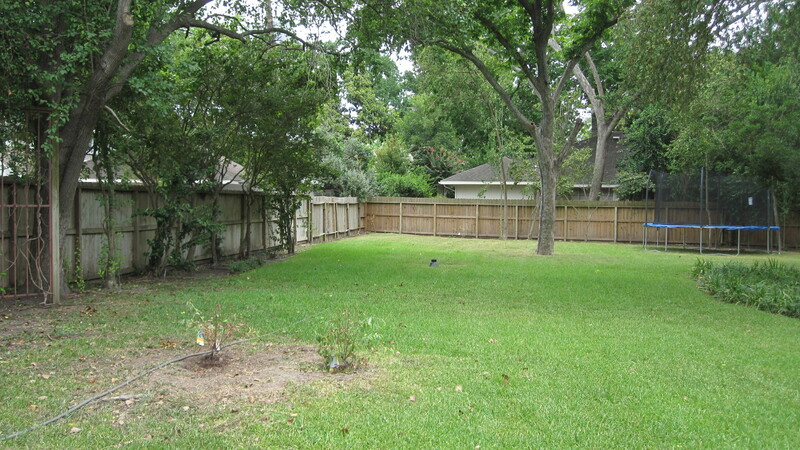 The low hedge of dwarf yaupon will create a boundary for the bedroom’s yard but still allow supervision of the rest of the property. Another narrow path, this one in the backyard, is a means of accessing the rear of the house while not taking up much space. The lawns, now grown in, provide a pleasant contrast to the straight lines of the house and beds. And we repeated the dwarf yaupon hedge as a boundary here too. In what was an unused space we created a long bed. 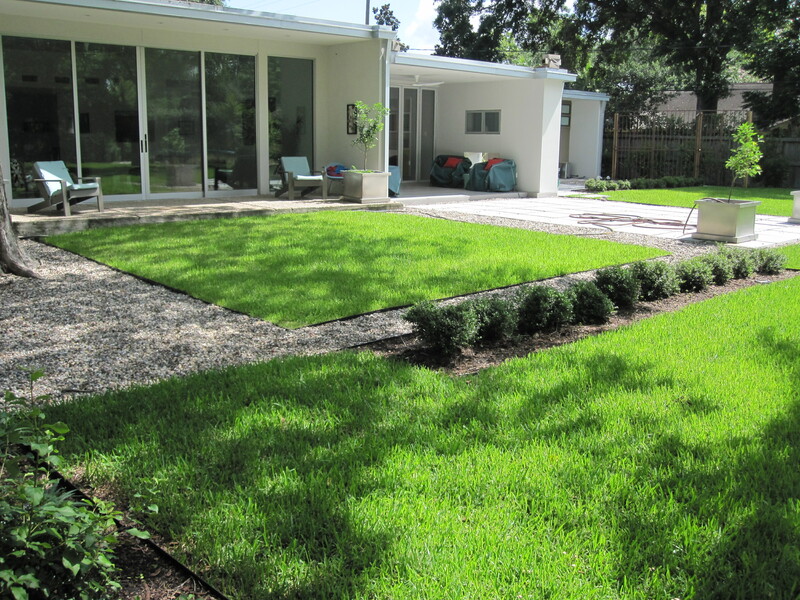 This construction helped define the yard as well as providing privacy in the future. 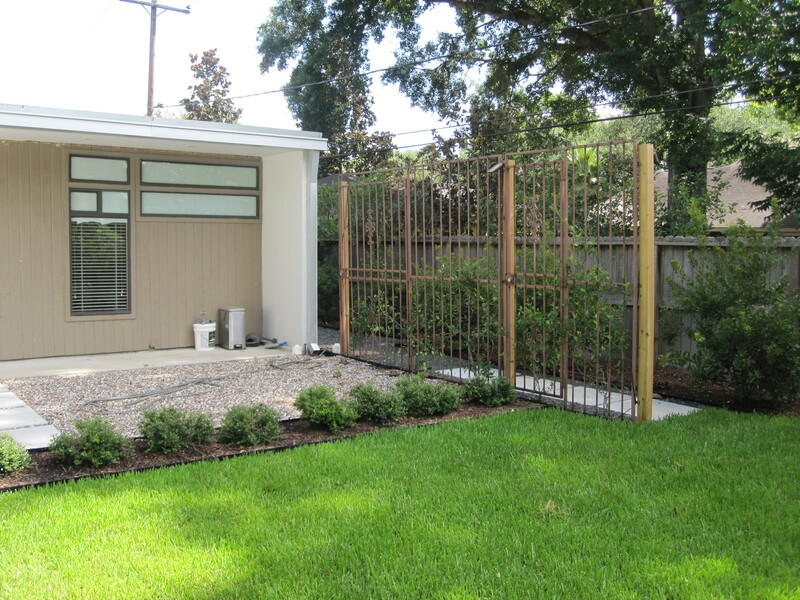 Wax-myrtles sit along the property line providing low-maintenance evergreen screens. River Birch are full of leaves in the summer and show off their peeling bark in the winter. 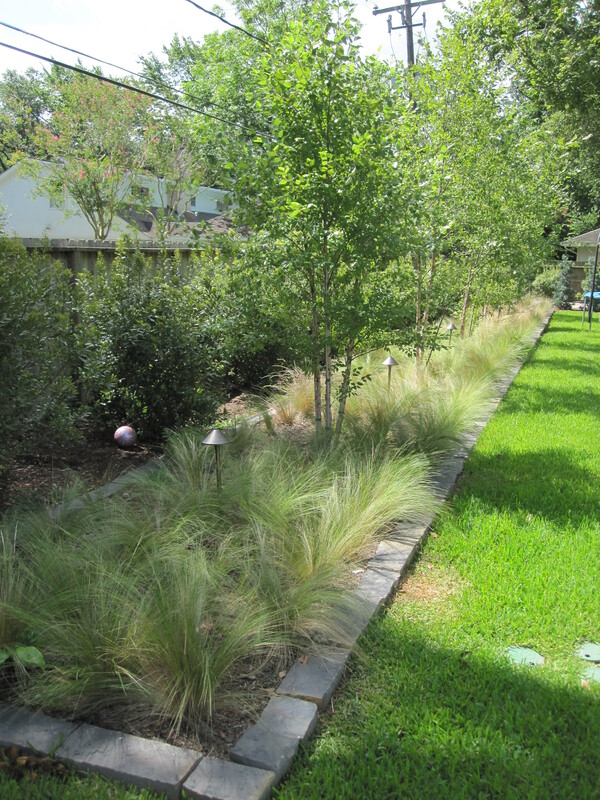 Raised bed using blue gray chop-stone with River birch and Mexican feather grass. In the rear corner we are creating a secret garden. The silver podocarpus will wall off the space in about five years. 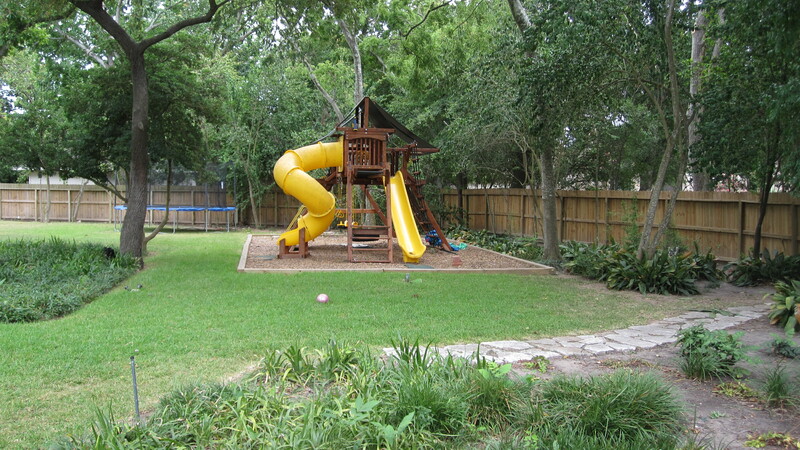 This gives the kids a great place to explore and play and adults a place to have a secluded meal. 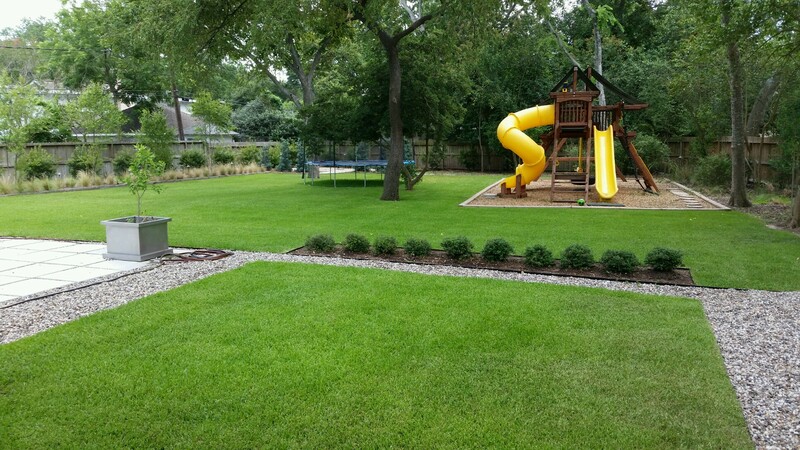 The Mexican feather grass has created a fun fringe and the lawn has filled in up to the edging stones. 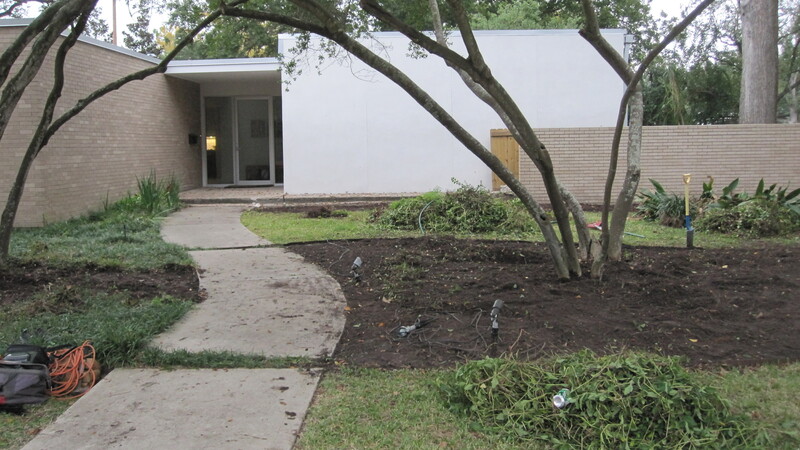 We cleaned up the area to the right and added in more understory shrubs and small trees like yaupon holly, possumhaw holly, ornamental grasses and in the back corner of the property we added a chalk maple, a drummond maple. View from the living room across the yard. The wax myrtles, along the back fence, had already grown several feet since we planted them. Next time we’re there I need to take pictures of the little woodland natural area. WOW! What a beautiful transformation. I am a sucker for straight lines and clean edges, I love how you’ve alternated materials and made it all look so clean and inviting. Thank you Loree : ) I really enjoyed this one! And it is fun to see it filling in so nicely. Love this. So often I read that paths should curve but for some styles the straight line is perfect. Really really nice, Laurin. Yes, what a beautiful transformation, very much in line with the modern architecture. This is my absolute favorite blog that you have ever done!!! looks like a TON of work but you did a great job! 🙂 so glad I stopped in. Luckily, we have a great crew and jobs like this take us about a week! 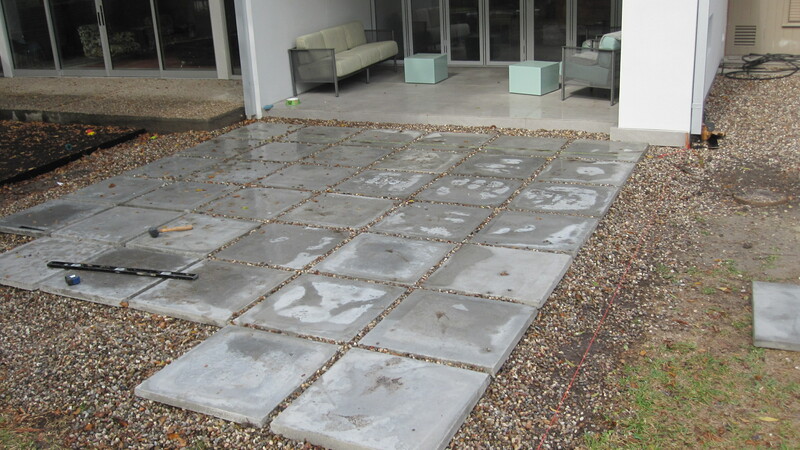 Would love to know where you purchases the concrete pads? Beautiful transformation! Thank you Laurel. We have them custom made at Camp Logan Cement a local company here in Houston. They come in many sizes and 2″and 3″ deep and can be reinforced. If you are not in Houston you can look were you are for a company that manufactures A/C pads they should have them. Where do you get the steel edging? Looks good. Thanks. 2221 West 34th Street, Houston, TX 77018 They are the company that makes Microlife and have many great products.